2 egg cartons filled with goodies for the elderly neighbor ladies who live below me. I did change how I put the goodies inside the egg cartons, I like this much better than the orginal version. You can go to Try it on Tuesday to see the first version and you still have until April 8th to play along with our Recycle It challenge! 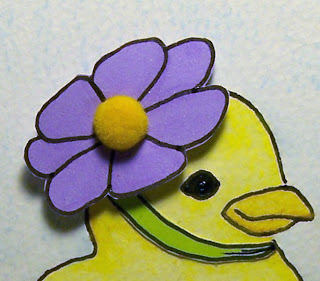 Did you know that there is a PEEPS web page? HA! "Is the shop you sell for online as well so others can look and order from it as well?" The answer is no. I chose to not do an Etsy shop because I want to obviate dealing with the Post Office on a regular basis. I love being in a shop where I can restock and then can walk away from it. I am lucky that I live in one of those tourist towns where there are a lot of people visiting the shop. ( excluding the months of January and February ). If you are interested in the card recap, go here. For the mixed media wall hanging recap, go here. Which came first? The quote or the sketch? I haven't a clue...but together they made for a cute Friendship card. I replaced the 3 dots in the sketch with a crack in the egg...just goes so perfect with the quote! 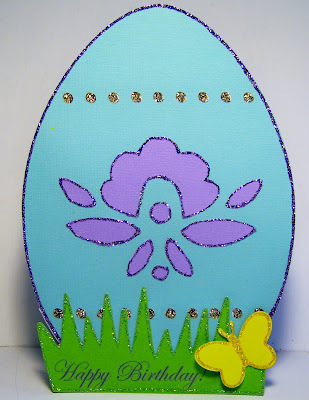 Stamped the butterfly directly onto the egg and then again on red paper, fussy cut it out and covered it with stickles. So that's 17 signs in 6 months, and like I said in this post, the Art MoB is tourist driven. The remaining 9 signs that sold are everyday based, ranging in all sorts of different themes. Create a piece using BUTTONS including a song (lyrics and/or title) that means a lot to you! Also entering this project into Simon Says Stamp and Show Quotable challenge. I knew I wanted to paint something that I could use and see everyday along with lyrics from the Beatles, which reminds me of my childhood. This was the first "canvas" that I painted along with Tracy on Monday night. Used a button for the Hot Air Balloon's basket. On this "canvas" I used a Quilter's pin wheel to create the star burst pattern. When I was a kid I use to love singing this song, lol I used a button for the center of the sun. Tracy went away for a week to supposedly work while in Las Vegas...yeah, we know what happens in Las Vegas stays in Las Vegas..wink wink I still painted Monday sort of re-creating one of my favorite wall hangings and used a rhinestone button ( removed the shank ) for the center of her outfit. Last Monday night I painted this one which I am also entering it into Pan Pastel's Photo Inspiration challenge. I was inspired by the salmon color and the flower. I used a pearl button ( removed shank ) for the center of the flower. So have you guessed by now what my "canvases" were? I like how I can turn it to fit my mood. One of things I would have done differently looking back, would be the way I did the buttons on the top of the box. I wish I had just chopped up all the buttons and made it into a more mosaic look. It also would have been easier to conform to the square shape. Cricut has been asking for Christmas stuff and one of their requests was for gift card holders. And I got to thinking, why not make Gift Card holders for sale at the Art MoB? ( gasp, lol I admit it, I shop at Walmart ) on the flag and added a brad by Karen Foster. Next I cut out the envelope which holds the GC, again from Doodlecharms, p. 86 but removed the heart cut on the envelope in the Cricut Craft Room and extended the flap cut by hand so that I could slide the gift card up and under the flap. Stamped the Ho, Ho, Ho by Karen Foster on the flap and added a Martha Stewart poinsettia sticker on the corner to add some balance to the red flag. Outlined everything with a Faber Castell PITT pen. Although the picture doesn't show it very well, it's actually a card, so the whole 'mailbox with GC' is the front of the card, leaving the person that sends it, a traditional inside to write their greetings. I have been asked how well sales have been going over at the Art MoB, and I have to say that I have been very lucky. The sales are definitely tourist driven so we had a couple of slow months during winter and I am still in the learning phase of what sells and trying to keep an open mind to what I can make that interests people. A total of 114 cards sold in the first 6 months. I try and keep 20 cards out at all times in each category, restocking once a week. So, I have 6 displays with 20 cards in each display, that's 120 cards out for the customer's perusal. It takes a lot of work to make sure I have a variety of cards but I do think that is important so that the customers have many things to choose from. On the bright side, I have 20 cards to try again with for next year! If you want to know how the Christmas cards did, check in tomorrow and you'll find out. If you want to know what's on my desk today, it's a project that I have been working on for Tracy Weinzapfels March Creative Dare. I have been gluing on buttons today and finishing it up. On the shelf you can see a dog house, cow and carrot card that never got finished for one reason or another. Everything else is just a mess, I have been a very little busy bee crafting and my desk is showing it, let's not even discuss the floor beside me. So let's nose around visit each other, gossip talk and have FUN! Our challenge is to use old packages, plastic boxes string etc and upcycle them!! Go check out what my fellow DT members created, I was blown away with their creativity! I love this challenge! I have 2 little old ladies who live on the ground floor and I enjoy making then surprises to have. I took a half an egg carton and embellished it. First applying some coordinating pattern paper to cover the top. Little Scrap Pieces is having a challenge to use a hand made embellishment. I made washi tape or faux ribbon, however you want to look at it, lol I took masking tape and laid it out on a piece of wax paper ( so it would lay flat to work on it, yet wouldn't stick ) Then I rubbed some Ranger Distress Stain on it and spritzed it with water. Then made faux stitching lines on it with a Distress Marker. Great way to trim the egg carton since it's tape.Added a small flower with a drop of Liquid Pearls to finish it off. 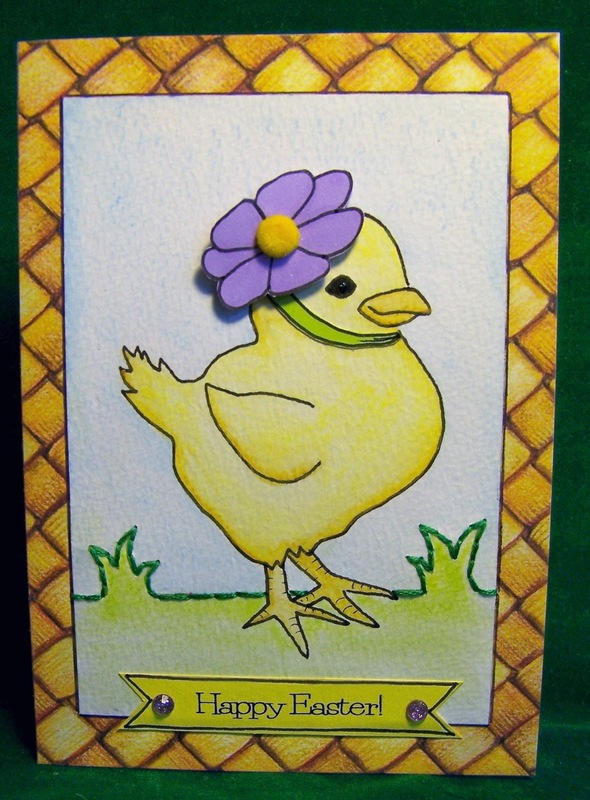 Over at Anything but a Card they are asking you to create something Spring or Alice in Wonderland related, and this definitely falls into the spring category! 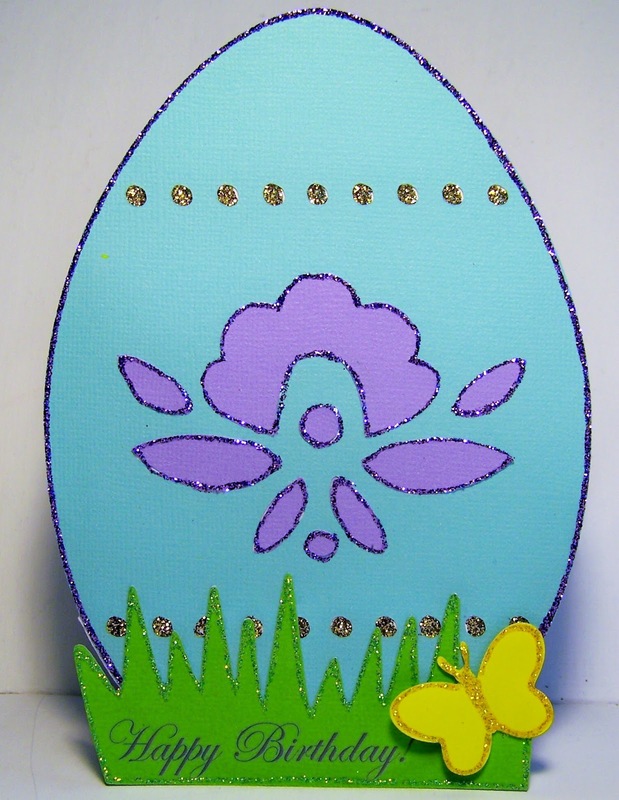 Our sponsor for this month's challenge is Craft-embellies with a £10 store voucher. Answer found here...you didn't think I'd tell you, did you? 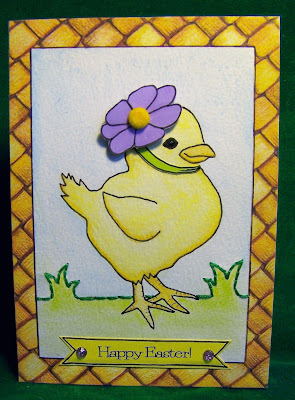 A little card I drew, I used water color paper and Faber Castell Aquarelle pencils to color in the back ground and the chick. Metallic grape Gelato for her hat and hand stitched some grass. Outlined everything with their PITT pen in black. A close up shot of her little flower hat and the fuzzy brad! The Liquid Scrapdots really do help balance the brad "underworkings" ( for lack of a better word for the parts that poke through the paper ) I also think paper piecing adds a lot to a simple card too, do you? I really do love dimension on a card, and haven't a clue why it makes me so happy? Everything came from my stash! Hooray, I love using up some of the bits and bobs that pile up! I free hand cut the mermaid tail, edged it with Vintage photo distress inks and then covered it with a layer of stickles. Used my craft knife to cut one of the waves out and slid her in. Used Liquid Scrap dots to lift the wave up a little and one of her fins. Used the Helmar 450 to hold down the big shell and Gemstone Adhesive to secure the micro beads. "Grift" was born in the argot of the underworld, a realm in which a "grifter" might be a pickpocket, a crooked gambler, or a confidence man—any criminal who relied on skill and wits rather than physical violence—and to be "on the grift" was to make a living by stings and clever thefts." Cath over at Moxie Fab has us all thinking about home decor projects. I took some tea light candles and wrapped some washi tape around them and then had tons of fun embellishing them. Warning here folks, this may become addictive. They are so cute and tiny! lol I can picture them in the guest bathroom or out on my balcony...either way I can't wait to make some more. Do make sure that anything you adhere to the tea lights is out of the way of the flame!! Yesterday was the second day of spring...huh? I woke up to this and thought I must be dreaming! So do you eat the tail or the ears first? 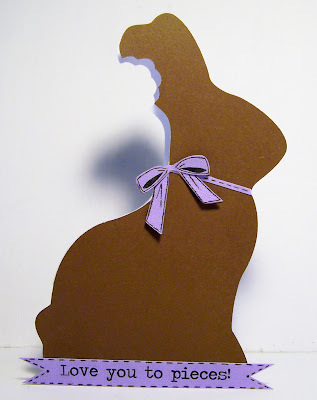 Ears for me, lol...although I haven't had a chocolate bunnies in eons! I love having a sketch challenge and trying to come up with an alternate way to do it yet keep within the parameters of the sketch requirements. I was worried at first at the mono chromatic aspect to the challenge but once I began digging through my stash it all came together on it's own. I just love that! I have used Liquid Scrapdots for many tiny things before but I think this little bee that I fussy cut out is the tiniest of them all! ANOTHER reason I love Liquid Scrapdots is the layering effect. I know that twine and burlap aren't that thick, but when you want your die cut to "float" equal to the material; it sure makes that feat possible with Liquid Scrapdots. With pop dots, you have a height you cannot manipulate, but with LSD, anything is possible! I used the LSD under the flower and under the top portion of the clay pot. rub on sentiment,twine, clay pot, glitter flower, burlap - misc. Reminder: Paper Playtime has their Challenge #6 to Use a Bee up an running. Actually, I loved every minute of it and want to thank them for the push incentive to create this piece. Lori - butterfly....who started the whole idea! Anna - book text and she found the quote for me to use too! OK, so I'm thinking this piece will work well for this ABAC challenge on a couple of levels. First, when I think of spring I think of butterflies. Here, I gessoed book text, inked it with Ranger's Dylusions and then ran it through the printer for the butterflies which I fussy cut out. I outlined the veins with my Faber Castell PITT pen in black. . I couldn't remove the yellow from the above picture, but it does show how I gave one butterfly some dimension with my Helmar's Liquid Scrapdots. I really do love this stuff!! I also am in love with the Goosebumps spray that gave this ink such a wonderful dimension. I also think this piece fulfills some of the Alice in Wonderland criteria as it has watches embossed with modling paste using the Crafter's Workshop stencil TCW 201S. I spritzed some Imagine Goosebumps spray before spreading out the Ranger's Distress stains ( using water ). Wonderful effect, will be using this more! "Oh my ears and whiskers, how late it's getting!" [singing] I'm late / I'm late / For a very important date. / No time to say "Hello, Goodbye". / I'm late, I'm late, I'm late." Then used my Distress Stains as splats. I hit them hard onto the board and it gives a wonderful ...splat! Thank you ladies, it's already hanging up in the Art MoB! Hi WOYWW'ers..missed me? Well, I missed you guys! I haven't done a WOYWW post in 2 weeks! I have been sooooooooo busy, I've joined 3 Design Teams, ( and it has taken a short adjustment period to get use to being on 3 teams, but I have a handle on it and have been progressing nicely, although I have tons of notes set up so I don't forget my challenges and what numbers to comment on!! ) THEN, I got accepted to do the May Arts New Release Spring Craft Challenge...and I've already sold 4 signs for this month so I need to make MORE! ( special note to all the Ranger fans, my first sign made from one of TH tag designs just sold!) woo hoo!! And some of you ( Thank you from the bottom of my heart for checking in with me and encouraging me along the way, it's been GREATLY appreciated ) have been keeping up with another challenge of mine which I am finishing up TODAY!!! The 30 Mother's Day cards in 30 days challenge issued by the Art MoB ( which is the gallery where I sell my things, for those of you that don't know )..and now we are going to have a "show" on April 6th for all the participants; ( whew ) so I am begining to work on my display...which is why I have the floor picture instead of a desk picture today. What's on my desk at the moment? ....is me typing this post! HA! It's a work in progress, just trying to get a general idea of how to arrange them. As you can see there is an empty space on the bottom row...which is where card #30, the last, the final Mother's Day card will go!! Father's Day are the next clamant cards! I am looking forward to freeing myself from the fetters of making Mother's Day cards! True or False Quiz time!